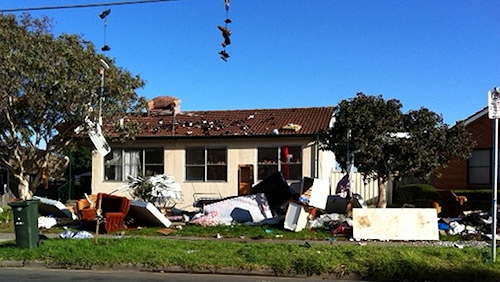 Recently, there have been a string of incidents involving trashed rental homes. Unfortunately, it’s not uncommon if a tenancy turns sour. Cases like these show some of the challenges property investors face. The house pictured above was found strewn with rubbish and furniture – including a sofa on the roof and a mattress wedged up a tree! The evicted tenants admitted owning the sofa, but denied putting it on the roof or making the mess. The landlord, who chose to manage the property himself, told the media that the place stank so much he couldn’t spend more than five minutes in it – and that he was scared to go there alone. In a run of bad luck over two years, a house in Kalgoorlie was damaged by fire, covered with graffiti and finally taken over by squatters – who wreaked yet more damage. The owner, who had landlord insurance, received more than $257,000 to cover the repairs, lost rent and the cost of hiring a security firm to protect the home during rebuilding. A young family left a home piled with garbage, with walls punched in and the fridge full of rotten food. The owner, Gordon Lee, told The Queensland Times he hadn’t taken a bond, had left property management in the hands of a mate, and would be forced to auction the house at a loss. Statistics show that professionally-managed properties are less likely to have tenancy related issues than those managed by their owners. A good property manager checks prospective tenants against databases of known troublemakers, speaks to referees, performs regular inspections and ensures a bond is taken. If a tenancy does turn sour, property managers usually have more experience managing the eviction process. However, there are no guarantees. Even if a tenant seems reasonable to begin with, people are complex and personal circumstances can change. Tenants may fall in with the wrong crowd or react badly to pressure or trauma in their lives – taking their “frustrations” out on the property. Eviction, in particular, is inevitably fraught with emotion for tenants. 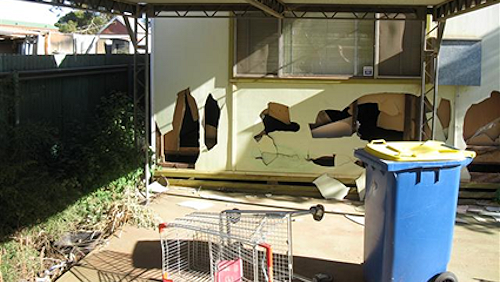 Unfortunately, some choose to literally hit back at the landlord by damaging the property. When a house is damaged, the costs quickly add up. There is the direct cost of repairs and the indirect cost of lost rent while the place is being fixed. By taking out quality landlord insurance, owners can protect themselves if their investment is damaged by tenants – both in terms of repairs and replacement rent. Landlord insurance can be purchased on its own or bundled with a house and contents policy. For more information, visit RentCover.